Halloween is just around the corner, so it is time to start buying candy for trick or treaters and planning your epic costumes. While most party goers will opt for the traditional scary and horror-themed costumes, why not think outside the box and try something to show your pride in our nation? Here are 15 patriotic Halloween costumes for you to try this year. What is more patriotic than the American flag? The red, white and blue symbolizes our freedom and independence as a nation and marks the beginning of our country as we know it today. You can easily incorporate the colors of the flag into a costume, or break out the face paint and show off your artistic skills. After courageously fighting for the independence of America, he brought together the fractured factions and was unanimously voted as the first President of the United States. Celebrate our founding father by wearing his traditional red, white and blue military uniform (which Washington designed himself), complete with the iconic white wig. Another favorite president is Abraham Lincoln. Beloved as one of America’s greatest heroes for leading the nation through the Civil War, preserving the Union and his role in abolishing slavery. He had a highly iconic look, usually represented as bearded and with a tall, black stove pipe hat. Uncle Sam is recognized as the personification of the American government, or of the American people in general. No one knows exactly where the icon originates from, but he is most famously represented in political cartoons and military recruitment posters. Depicted as a tall, thin man with white hair, he is most recognizable from his star and stripes, stove pipe hat and coat tails. While Uncle Sam has become the icon representing the American government, the less known goddess, Columbia, is the official personification of our nation. Columbia is the feminized version of the name, Columbus, the explorer who discovered America and carries deep patriotic meaning, going back to the founding of the country. She is usually presented in a classical garb, printed with the stars and stripes, or wearing a star-spangled sash and brandishing a sword and shield. Betsy Ross is widely credited as the woman who created the American flag, after convincing General George Washington to change the shape of the stars originally proposed for the flag. She has become a historical legend and a symbol of how women shaped American history. She is depicted in art works in typical colonial dress, often presenting a flag to George Washington. Betsy Ross is a fun and educational costume for a young girl to show off her patriotic pride for our country’s historical heroes. Possibly America’s most famous landmark, the Statue of Liberty symbolizes the ideals of freedom, compassion and the pursuit of the “American Dream.” Her iconic crown, gown and flame will make your ensemble easily recognized and is the ideal costume for showing your pride in our nation. Depicting four of the country’s greatest presidents, the epic scale of Mount Rushmore represents how our nation was founded, and how it developed into one of the most powerful nations in the world. Get creative and try to DIY your own Mount Rushmore costume, or turn it into a group costume by having a few of your friends dressing as the other presidents. Created in 1940 in reaction to WW2, Captain America represents the epitome of human physical perfection, has a deep sense of patriotism and relentlessly pursues justice. No other character in the Marvel universe has undergone such huge costume changes over the years, so you have lots of options to choose from, such as his original star and stripes bodysuit or his new stealth body armor. Though technically Wonder Woman hails from Themyscira, the Amazon princess has been adopted as an American icon, thanks to her unwavering pursuit of truth and justice. She also has a seriously cool costume that shows off her sense of patriotism. Wonder Woman has worn many different costumes over the years, so try one of her earlier styles for a modest vintage look. Or, don her gladiatorial armor from her most recent movie to look like a hero you definitely don’t want to mess with. Take inspiration from one of America’s favorite pastimes, which is football. There is no better way to celebrate dedication to your country and team than by wearing your team’s jersey or colors. It is a great low-key costume option, as most fans will have a jersey already in their closet. If you prefer a more elaborate Halloween costume, break out the cleats and shoulder pads to complete the overall look. Where would a football player be without his football? Include the pint-sized members of your family in a sports-themed group costume, by dressing your littlest patriots as a football. You could DIY your own costume with a brown onesie, brown beanie and a black Sharpie. Or, there are many options available online for purchase for a fun costume that is sure to score a touchdown with neighbors on your “Trick or Treat” route. Another cultural icon that celebrates American values is Rosie the Riveter. As a feminist icon, she represents the women that entered the workforce and kept the country going while the men were overseas fighting. You can see the Bald Eagle on our money, stamps and the National Seal. He represents the authority and independence of America. 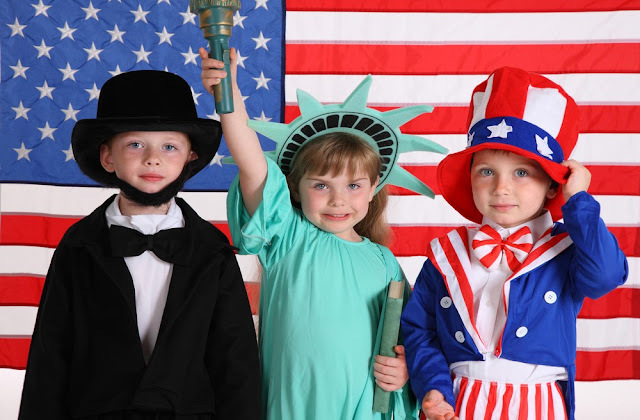 Though adults might feel a too cutesy in a fuzzy, bald eagle costume, it would make an adorable kids’ costume and a way for them to express how much they love their country. But, if you admire the strength and grace of our National bird, there are some amazing costume ideas online. American patriotism goes into overdrive is at the Olympics, so show your pride for our athletes by wearing the U.S. Olympic team uniform. Gather some friends and turn this idea into a fun group costume. There are bonus points if you have the national anthem playing while trick or treating.